Edging Stone molds produce stones of approximately 14-15″ in length. But what if a 9″ stone is needed to finish the project? Here are two simple solutions. • Unmold a newly hardened stone. Pencil off the desired length, then create a 1/16 inch “perforation” line across the stone using a hacksaw (fresh concrete is still fairly soft so this won’t be difficult). Place the stone on a work table and position the “perforation” over the table’s edge. Hold the stone firmly on the table, then gently break off the scored end, much as you would a square of chocolate. • Shorter stones can also be made using oiled cardboard. Cut a piece of cardboard the approximate width and depth of the border mold, 8″ x 2″. Oil the cardboard on both sides. Pour concrete into the mold, then insert the cardboard into the mold at the desired length. Don’t worry about getting a perfect fit; if the hardened segments are slightly joined, they’ll separate easily with a little pressure. 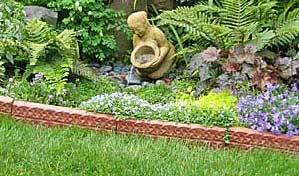 The border stones have been designed to set vertically in the ground. But some gardeners may want to lay stones flat for easy lawn mower access. If so, you’ll probably want the patterned half only. Oiled cardboard works perfectly for this. Cut a 15″ x 2″ strip of cardboard, brush both sides with oil, then place lengthwise down the center of the filled mold. After demolding, save the plain half. For subsequent pours, oil this “plug” then insert in mold; 50% less concrete will be needed to fill the mold.